According to Acts 20:28, God acquired the Church for himself with the blood of his own Son, whilst Ephesians 4:13, 15 proposes that the Church, the body of Christ, has to grow towards the measure of the fullness of Christ and into Christ. For this to succeed, there must be a comprehensive approach to building the local church, even though it may not have a single element that could account for congregational development. Building the local church (BLC) through a needs-oriented diaconal ministry (NDM) that meets effectively the needs of the community and its people by providing the essential functions of the church, such as koinonia, diakonia, kerygma and leitourgia in synergy, will be helpful to congregational development, functioning as a living organism that leads church members to vitality and equips them to fulfil the variety of works available in the body of Christ. This article focused on two key factors that can be used to develop a sound and effective BLC through NDM, namely, (1) BLC through NDM supports a sound theory of congregational development and (2) BLC through NDM makes for an effective strategy to promote congregational studies. To this end, this article presented and interpreted data from a case study of the baby schools of Choongshin Church and Daegwang Church and the pregnant women's group of Daegwang Church in South Korea, in order to prove the soundness and effectiveness of BLC through NDM and suggest a diagram of BLC through NDM. When BLC through NDM is utilised fully and applied to the missionary strategy in urban areas, more people will become meaningfully involved in Christian life and membership of the churches. The Church has an important role to play, not only with those who already know Jesus, but also with those who have not known him. This is our evangelistic responsibility (Armstrong 1979:60-61). The importance of the local community as the field of the Church's ministry should be emphasised (cf. ed. Nicholls 1986:11-12). As the quality of life of the Korean society, culture and economics has been improving lately at a much faster pace than in the past, considerable diaconal service changes are needed to serve the local community effectively. However, Korean congregations have neglected to change in the right direction and to act according to the changes in the community and society. Lee (2004:332-335) argues that, on the one hand, the Korean Church has been concentrating its efforts mainly on 'growth' of the Church itself (cf. Schwarz 1998:44-45) but, on the other hand, it has made very little investment in its diaconal ministry. As such, this has resulted in a disconnection between the Church and the community. The research problem of this article - investigated through a case study of the baby schools of Choongshin Church and Daegwang Church and the pregnant women's group of Daegwang Church in South Korea - shows that the diaconal services of the Korean churches do not relate directly, intimately and lastingly to the needs of non-Christians and, as such, the people served by the mission do not become meaningfully involved in Korean congregations. This article, as with other original research in this area, departs from the research hypothesis. When needs-oriented diaconal services of the churches serve the actual needs of non-Christians, and long term and intimate relationships are built with the people served by the mission, more people reached in this way will become meaningfully involved in Christian life and membership of the Korean churches. Building the local church (BLC) through a needs-oriented diaconal ministry (NDM) aims at meeting the non-Christians' need to predispose a positive view of the church in the community, to serve the local community as the field of the church's ministry, and to establish the Christian life and membership of the congregations. The community, with its rapid pace of change, urgently requires church structures that can change effectively in order to satisfy the needs of the local community (cf. Pierli 2005:33). To develop a sound BLC through NDM depends on how the synergistic ministries of the church are organised: diakonia with the ministry of preaching the gospel (kerygma), all the forms leading up to the worship of God (leitourgia), as well as the expression of the unity of the church (koinonia) as the body of Christ. Effective and contextualised principles that reflect the relationship between the gospel and the Korean culture are imperative in order to develop a contextual Korean congregational development theology. God gives special ministries by which people are to be equipped and trained. These ministries are referred to as the metaphor of the 'joints' (Eph 4). Christ is the Head. As he grants the vitality and as the whole body grows towards him, this growing body is held together, united in service, and trained by the 'joints' (Eph 4:15-16). God builds his congregation in Christ and uses people for special ministries granted by him. At the same time, the congregation builds itself. This 'building' of the body involves its growth to full maturity (Bruce 1991:13). A healthy balance is necessary for BLC: the special ministries, the 'joints,' are not to be absolute or underrated - and the same goes for the 'ordinary' members of the body (Martin 1979:72). Believers are to be equipped and trained for BLC. Their service is the building of the body individually and together with the 'joints' given by God in order to train them (Eph 4:11-16). Through the proper functioning of the parts, the whole body is to be active in promoting its own growth, although ultimately it is Christ who is seen as providing the means for the body to carry out such activity (Lincoln 1990:262). Three phrases are used in Ephesians 4:12 to describe the purpose of the spiritual gifts, namely, (1) the 'joints' are there to equip the believers, (2) every Christian has a ministry, a spiritual task and function in the body and (3) these gifts build the body of Christ (Foulkes 1989:128). According to Nel (2005:30), the congregation and the process of BLC serve the glorification of the Father, Son and Spirit. The communication of the gospel helps to build the local church through the synergy of four ministries, namely kerygma, leitourgia, koinonia and diakonia. Diakonia is an expression of the unity of the church (koinonia) as the body of Christ (Robra 1994:281), because such a diakonia [service] builds koinonia [community]. But it requires personal, psychological and ecclesial maturity (Cummings 2004:12). Diakonia therefore must be redefined, not as a good moral act, or as the expression of compassion, but as the overflowing of the grace, which binds and moves the community's inner life as a fellowship (koinonia) (Collver 2010:345). Whilst diakonia claims unlimited scope outwards, wherever there is distress, it also claims the same scope inward, in a special sense; that is, within the community (koinonia) of the church's own social forms (Fuchs 1988:47). Building the local church is focused on diakonia that grows out of the koinonia consciousness of the congregation (Nel 2005:51). Paul expanded the concept of diakonia, in that he saw the whole of salvation - God's diakonia in Christ, for and amongst men - expressed in the diakonia of the apostles. This service has been entrusted to the apostle, who, as Christ's ambassador, proclaims, 'Be reconciled to God' (2 Cor 5:18 NIV) (Hess 1992:547). Hence, the term diakonia can be used as a technical term for the work of proclaiming the gospel (kerygma) (Rm 11:13; 2 Cor 4:1; cf. 2 Tm 4:5). The understanding of preaching the good news as diakonia is linked inevitably with the fact that preaching introduces a person to the highest value that is God and his salvation. The definition of diakonia as 'service to the world', defines the mission of the Church to proclaim the gospel (kerygma) (Donfried 1992:3).  The liturgical life has to nourish the Christian life not only in its private sphere, but also in its public realm. One cannot separate the true Christian identity from the personal sanctification and love and service to humankind (1 Pt 1:14-15).  Liturgy implies public and collective action and therefore the Christian is, in a sense, a creator of community. The Christian has to be a continual builder of the true koinonia of love and peace, even if he is politically marginal and lives in a hostile surrounding. Thus, service that counts is not the service performed at the altar, but the service which reaches out from the altar to humankind: the true liturgy (leitourgia) of the Christian community is its diakonia (Collins 1990:13). An effective ministry of a modern Church can be seen in the individual lives of its members. When their felt needs are met, they are happy, and every day they become more and more autonomous and free (Olson 2002:22). The principle of BLC through NDM rests with the synergy between diakonia, leitourgia, kerygma, and koinonia as the way to build cohesiveness in the group (cf. Nel 2005:30). The proclamation (kerygma), fellowship or community (koinonia) and service (diakonia) of the Church, which is the expression of life, is constituted by trinitarian love (Althouse 2009:242). The relationship between them can be separated, but it should not be (cf. Guder 1998:54). The synergy of the ministries is the basis of BLC. It should take place through all the activities of NDM. For example, in the baby school and the pregnant women's group of the case study to follow, intimacy (koinonia) is achieved by, (1) teachers or instructors' effort to create a family mood amongst learners and (2) mothers' effort to comfort, to care and to cultivate a feeling of stability through communicating with them. Christian mothers of classmates or group members promote the worship of God (leitourgia). Classmates or group members hear the gospel (kerygma) from teachers. Thus, to build the local church, the ministry of that church as a whole should engage in the service of the communication of the gospel (Nel 2009:439). The church's synergic missional ministry in BLC through NDM will help to reform the Korean congregations to change from being growth-oriented to maturity-oriented. It will lead non-Christians to faith and Christians to maturity in faith to build vital, healthy and balanced congregations. McGavran's Church growth principle can be summarised through the concepts of a 'homogeneous unit,' a 'people's movement' and 'receptivity' (Kim 2008:143). These theories will be helpful to track the development of the sense of BLC through NDM, the importance of intimate and lasting factors for effectiveness, and the possibilities of using the baby school and the pregnant women's group for BLC through NDM. Church leaders who live in a developed urban environment apply McGavran's principle through seeking to eliminate cultural barriers to the gospel (cf. Hughes 2007:2). People are included in homogeneous units, although some are linguistically, ethnically, economically or educationally different from others (McGavran 1982:225). This unit can be applied to members who have common needs in spite of heterogeneous religious backgrounds, different characteristics, ages and cultural gaps. In other words, BLC through NDM has the characteristics of both homogeneity and heterogeneity. The growth in these homogeneous units in the setting of BLC through NDM is significant for understanding how to grow effectively in the Korean churches (cf. McGavran 1982:97). Homogeneous groups exist in the private sphere and are a legitimate expression of urban life (DuBose 1978:123). For instance, the characteristics which the baby school and the pregnant women's group have in common are that parents have babies and women are pregnant, respectively. Thus, it is easy to share information, ideas and feelings between the pregnant women's group and the baby school. It is a good point of departure to meet non-Christians and to get along with Christians naturally and intimately. What really happens in a people's movement is that in relatively small, well-instructed groups one individual becomes a Christian this month and another several months later. Numbers are certainly achieved, but usually only with the passage of years (McGavran 1982:335). In a people's movement, members of the close-knit group seek to persuade their loved ones of the great desirability of believing in Jesus Christ and becoming Christians (McGavran 1982:341). The principle of the people's movement in the setting of BLC through NDM is effective to both non-believers and believers, because each member of the group can experience Christianity or an improvement in faith. Through the baby school and the pregnant women's group, which both consist of small groups that have communion with one another, there is a high possibility for Christians to mingle with non-Christians naturally, to communicate needs in common with them, and help them to be open, acceptable and receptive to the Christian faith. The receptivity principle asserts that there are times and places where some groups of people are more receptive to the gospel than others (Hughes 2007:1). Immediate obedience after hearing the word of God depends on the person. It means that receptivity differs from one person to the other. With those who resist Christ solidly in the diaconal ministry of his church, the church should try to break down all barriers that prevent them to believe in Christ. The church needs to incite a mood of receptivity and to wait and pray for them until they show reaction. The receptivity theory can be applied to the baby school and to the pregnant women's group in that they both have Christian and non-Christian members. In a homogeneous unit, a people's movement would be influenced by the extent of the people's receptiveness. This takes place whilst they are mingling with one another over a period of three months or longer. After proper instruction and proclaiming the gospel, there is a high possibility that the non-Christian mothers will be receptive to experiencing Christianity. Whilst the urban Korean society is developing rapidly, the forms of the diaconal service diversify and develop to meet people's needs. The Korean Church has to consider the environment of the community to serve it effectively. An effective NDM of God's people for the community's salvation is indicated by their need. The Christian Church is located within the civil community. Issues of the public sphere affect and shape the characteristics of congregational life and mission (Chung 2010:141). Individual behaviour or attitudes are influenced by the local environment, especially the typical values and role models present within any neighbourhood (Herbert & Davies 1993:80). The community influences the forms of the diaconal ministry, which, at any particular time and place, depend on the nature or need of the neighbourhood in the community (cf. eds. Greinacher & Mette 1988:xvii). Forms of the diaconal service that stimulate the social and cultural motivation of people in the community can be effective practices of service (Boskoff 1970:94). The social characteristics of need are seen in the social factors that lead to a situation in which persons or groups are not able to achieve or maintain social integration without assistance (Klinken 1989:21). All Christian diakonia must offer its services on the immediate practical and personal level of relief of personal need (Delkeskamp-Hayes 2009:191). Thus, an effective NDM that complies with the community's needs, including their physical, mental, cultural and sociological needs, requires the Korean congregations to cater for the social and cultural characteristics of the community and the people involved in it. 'In the twentieth century the church has discovered social responsibility as part of the gospel' (Attfield 2001:18). The social responsibility of the local church defines our identity in the society and shapes our lives. The community dimension has to do with the way a social system defines, allocates and uses social relationships (Hiebert 1996:140-141). To revise the role and practice of the church in a new context requires the discerning of God's will and following his guidance. It often takes considerable effort by a faith community to deal with this process (Hendriks 2007:1007). In the Acts of the Apostles, the church is introduced and characterised as a community fellowship and diakonia (Ac 2:42-47). The church is an interpretative community in an ongoing engagement with the remembered patterns of God's praxis (Hendriks 2007:1011). All Christians are expected to be involved in the care of the poor and these actions should be emphasised as an important role of the diaconal ministry. Its role can influence the Korean congregations to become a centre of community service, as God wants them to meet the needs of the Korean people with a proper diaconal ministry. The church should recognise the obvious truth that proclaiming the gospel and communicating the gospel are two different things. Proclamation is a necessary and valid form of evangelism, but it cannot assume that, just because the gospel has been proclaimed, communication has taken place (Armstrong 1979:57). Effective communication is vital in maintaining a productive working community and environment, in building positive interpersonal relationships and for solving problems effectively (Manala 2010:4). The relationship between communicator and receptor in the diaconal ministry should be clear. Effective communication of the gospel depends not only upon a thorough understanding of the content of the message, but also on an ability to relate that message to the contemporary situation (Gibbs 1981:84). The communication of the Christian gospel should be the central task of the church in the modern, secular, pluralistic and individualistic age (Attfield 2001:155-156). In Christian diakonia, voluntary and professional service providers, as well as the recipients, should be aware of the centrality of the church in all diaconal undertakings (Delkeskamp-Hayes 2009:192). As a servant to the community, the local church exists to minister to the needs of people. The church must serve the whole person - catering to physical as well as spiritual needs - just as the churches of the New Testament did (Armstrong 1979:58). As missional congregations, it is necessary to return the ministry to the people and to win over the non-Christians who have never been to church (Sjogren 2002:33). God initiated something that changed people and formed them into a missional community that is called to love God and their neighbour (Hendriks 2007:1013). Thus, understanding the relationship between the church and the community and its importance is essential for relevant communication of the gospel. An encounter between different cultures and civilisations is prone to clashes and conflict, resulting from the view of different religious and cultural communities (Chung 2010:142). According to Klinken (1989:31), the New Testament illustrates examples of solving problems that arose in 'human need' in social and cultural contexts. Aware of the distance between the cultural context of the Bible and our own cultural environment, we have to be modest in arriving at conclusions for the contemporary diakonia. Deacons were selected to give special attention to such matters, so that there might be unity in the Church (Ac 6:1-6). The solution was to handle 'the social problem in the early church ... administratively accordingly to the cultural method' (DuBose 1978:127). The diaconal ministry of the early Church should not dictate the shape of today's ministry. Our times are different, our cultures are different and therefore the needs of today's church are somewhat different (Cummings 2004:30-31). The work of evangelism, which begins with how one communicates the gospel in meaningful terms, extends to the kind of Christian community that can most authentically express the new life of the gospel within that cultural context (Gibbs 1981:85). The Church's ignorance of the wider culture is problematic. Owing to its cultural entrenchment, the Church no longer relates to the surrounding culture; hence, it is increasing marginalised and perceived as irrelevant (Gibbs & Bolger 2006:15). The factors influencing the diaconal ministry are therefore related to the characteristics of the society and the culture. These factors play an important role in dealing with human needs. The attitude toward human need is influenced, to a very great extent, by cultural values and norms, and the actual kind of human need also influences people's response to that need. Permission to conduct the study was granted by the college of education. The pre-service teachers gave their consent to participate in the study. The aims and objectives of the study were discussed with them. The names of the preservice teachers were not divulged. The diaries were stored away safely by the author. The respondent sample comprised four sections, (1) the baby school of Choongshin Church which meets once a week (CS:1xBS, n = 71 persons), (2) the baby school of Choongshin Church which meets twice a week (CS:2xBS, n = 50 persons), (3) the baby school of Daegwang Church (DG:BS, n = 38 persons) and (4) the pregnant women's group of Daegwang Church (DG:PWG, n = 27 persons). For each research survey question, respondents could select from a series of statements that best described their perspectives. For the sake of brevity, only two or three of the most popular answers to the questions are noted in the subsections that follow. Table 1 indicates the necessary kinds of diaconal ministries distribution. The statement 'Useful and actual ministries as found at the baby school, pregnant women's group, et cetera' was chosen by 43.24% of the CS:1xBS group, 38.89% of the CS:2xBS group, 42.86% of the DG:BS group and 40.74% of the DG:PWG group, whilst the statement 'Providing play rooms for children' was chosen by 27.92% of the CS:1xBS group, 28.89% of the CS:2xBS group, 22.86% of the DG:BS group and 33.33% of the DG:PWG group. This may indicate that these respondents think a variety of diaconal ministries should be organised by the church for the local community's needs. Although the distribution of the groups' answers on intimacy aspects is high, the answers on the evaluated education, faith and other aspects received the least support (Table 2). A possible reason may be that people have different religions, characteristics, age gaps, et cetera and do not get along easily with one another. The evaluation by respondents of the CS:2xBS group on the intimacy aspects was better than that of the CS:1xBS group. A possible reason may be that to have a long class twice a week is more effective than to have a short one only once a week. It seems that the longer contact times could provide longer periods for mingling, opening minds and getting acquainted with one another. Table 3 shows the distribution of reasons on intimacy with teachers (instructors) (the three most popular selections). The statement 'Instructors (teachers) always try to make a family mood among learners' was selected by the majority of members: 48.84% by the CS:1 xBS group and 51.51% by the CS:2xBS group. The statement 'Instructors (teachers) always try to understand a variety of situations, events and stories, et cetera, of learners' was selected second most, with 30.23% by the CS:1xBS group and 27.27% by the CS:2xBS group. It seems that the respondents of the CS:1xBS group and of the CS:2xBS group set a relatively high value on the role of teachers (instructors) that are capable to create a family or good mood in the school (group). 42.10% by the DG:BS group and 41.18% by the DG:PWG group. The second most popular reason selected was, 'We have lots of common things to share as group members (classmates)', with 33.33% by the CS:2xBS group, 34.21% by the DG:BS group and 26.47% by the DG:PWG group. It seems that sharing common experiences engenders a sense of intimacy. The statement 'I have the opportunity to rethink Christianity through the love, caring, comfort, kindness, et cetera, from the teachers (the instructors)' was the most common answer amongst 46.25% of the CS:1xBS group, 45.90% of the CS:1 xBS group, 25.00% of the DG:BS group and 50.00% of the DG:PWG group (Table 5). It appears that when the church provides a diaconal programme or meetings, the teachers (the instructors) have a relatively important influence -either positive or negative - on the experience of Christianity by the respondents in the groups. Table 6 shows the frequency distribution of preaching the gospel in the baby schools and pregnant women's group. The predominant answer was 'Very often done' amongst 43.66% of the CS:1xBS group and 52.00% by the CS:2xBS group. The answer 'Sometimes done' was predominantly answered by 73.68% of the respondents in the DG:BS group and 55.56% of the respondents in the DG:PWG group. A very small percentage of respondents indicated that the gospel was never preached. In all the cases, the majority of respondents supported the statement that the groups are helpful in building the local church; however, it appears that the percentages for Choongshin Church are somewhat higher in this regard than that of Daegwang Church (Figure 1).  Building the local church through NDM not only meets members' various needs (see Table 1), but also provides them with the important functions of the church, such as koinonia, kerygma and leitourgia (see Tables 2, 5 and 6).  In order to establish the warm intimacy of the groups, it is more effective to have a long class period twice a week than to have a short one only once a week (see Table 2).  When instructors create a family mood amongst learners who communicate well with other members, members experience more intimacy in the groups (see Tables 3 and 4).  Building the local church through NDM seems to be successfully helpful in congregational development in the local community (see Figure 1). This study shows that BLC through NDM is positively helpful for congregational development in the Korean community. A practical outcome of this research has been the development of a diagram that illustrates the sound and effective principles of BLC through NDM (Figure 2). 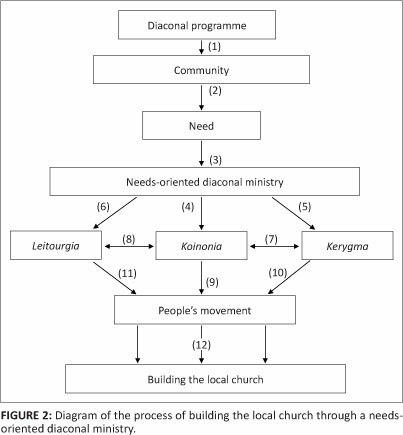 If followed correctly, this diagram demonstrates how local churches can move from the creation of a diaconal programme through leitourgia, koinonia or kerygma, to building a sound and effective church that fulfils the needs of its congregants. The first question one needs to ask is why are the present diaconal ministries ineffective, especially as far as congregational development is concerned? This leads to the creation of a diaconal programme, which is defined with its origin in the theological tradition, church history and sociological background. The following is an explanation of the various steps within the diagram. Firstly, Arrow 1 leads to community. To research the community is strongly needed, because the modern local community has been improved economically and educationally. Church leaders have to study the community in which they operate. Arrow 2 indicates that the actual need of the community, as indicated by research, because the present diaconal ministries are not satisfactory. The question here is why the diaconal ministries do not promote the building of the local church? Sometimes the local church is rendering humble service, but the community does not know about it. Arrow 3 therefore points to needs-oriented diaconal ministry. It indicates that the diaconal ministry can be effective to promote BLC. Building NDM explains how effectively to organise the structure of diaconal programmes for BLC with God's love through serving the community. Arrows 4, 5 and 6 indicate koinonia, kerygma and leitourgia, respectively. It is very important to balance the synergy between these for congregational development. Even if there is a diaconal ministry, it will be more effective when there is a synergy between koinonia, kerygma and leitourgia for a healthy BLC. Because koinonia has a core role in NDM, Arrows 7 and 8 indicate the order of focus, koinonia <-> kerygma <-> leitourgia. This order is recommended in order to meet effectively the community and its needs through a diaconal ministry (diakonia) with intimacy (koinonia) and to decide the method and frequency of preaching the gospel (kerygma) and worshipping God (leitourgia), according to the number of believers and non-believers in the group. Arrows 9, 10 and 11 point to people's movement. At this stage, believers and non-believers experience growth in their faith. Christian members and teachers have an important role to play in influencing both non-Christians and as fellow Christians. Finally, Arrow 12 indicates building the local church, which helps Christians and non-Christians to experience the benefit of the diaconal ministry. It leads non-Christians to faith, Christians to maturity in faith, and to vital, healthy and balanced congregations. BLC through NDM will be actively carried out for congregational development in the community. BLC through NDM aims to renew the essence of the church with God's love and service, to improve the image of the church and to serve the local community and its people by preaching the gospel during services through the synergy of diakonia, koinonia, kerygma and leitourgia. The agents of the church that serve the local community should be balanced. They should be helped to be able to preach the word of God and guide the way of the life where they serve. The Korean churches can grow by recovering its nature, which includes an effective BLC through NDM for the salvation of, and service to, the community. Korean churches have to take interest in the ideology of BLC through NDM in order to guide social life towards to the principles of God's kingdom. It is to lead non-Christians in the community to salvation through faith in Jesus Christ as their saviour, to help them to become involved meaningfully in church life and to improve the faith life of Christians. Kim, h.o., ['A study of the theological paradigm in the theology of traditional church growth and a theology of Natural Church Development'], [Theology and Praxis] 15, 123-154. Lee, B.S., ['An analysis of retardation of growth in the Korean Church'], [Christian Education Information] 8, 317-340. Note: This article is an adaption of the Ph.D. disseration of Revd. Yun which was completed under the guidance of Prof. Malan Nel, Department of Practical Theology, University of Pretoria, South Africa.